In the baking Texas heat, the last thing you want is a hot pool. Not only does it prevent you from cooling down at the end of a workday, but it’s also going to make you reluctant to use it even on weekend and holidays. While in colder states the idea of a warm pool is a luxury, as Texans we know that once the weather ticks into the 100’s for weeks on end the water can start to become uncomfortably warm. Cooling your pool is the only realistic option to ensuring that you can still use it throughout the summer months. While you can certainly use a warm pool, how long would you want to stay in it? Probably not for more than a few minutes, which is why so many Texans are calling Willsha Pools to install quality pool chillers for them. They are incredibly effective, well-priced and can ensure that you and your family can enjoy the refreshing water throughout the summer. Why Should You Cool Down Your Pool with a Pool Chiller? There are two reasons why you should cool down your pool. Firstly, you chose to invest in a pool in the beginning because you wanted somewhere that your family could relax and have fun. How much fun is it to jump into a warm pool after sitting out in the midday sun? Not very, which is why installing a pool cooler is practically a necessity. Secondly, safety is an important consideration especially if you have any heart problems. Excessive heat can cause people to faint which is incredibly dangerous in the water. Keeping the pool chilled by using a swimming pool cooler will drastically reduce the risk of overheating and gives you a convenient option for reducing your body temperature. Now that we agree about the necessity of cooling your pool, we need to look at the different types of pool cooling systems and how you can cool pool water itself. 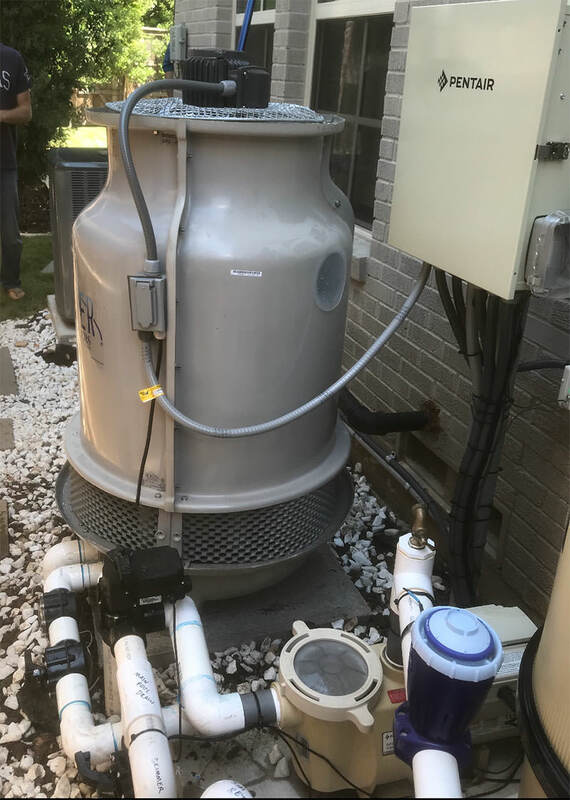 There are at least five different methods that we’ve seen discussed online, but as experts in the industry, we’re here to tell you that only one of them works well and that’s using an internal pool cooling system. Cool swimming pools are all the rage and not only does a fountain or waterfall add an aesthetic bump to your yard, but it can also help to reduce the temperature of your pool. By keeping the water constantly moving you can increase the rate at which heat is transferred to the air and the rate of evaporation. Both of these factors can help to cool the water. But when people ask us how to cool pool water, they’re typically looking for a large change in the temperature, and a fountain or waterfall isn’t going to give you that. You might get a couple of degrees difference, which will certainly feel refreshing, but it won’t come close to the effectiveness of a swimming pool cooler. Another method that we’ve seen mentioned online is to dump a bunch of ice into your pool. While this certainly seems logical, the cooling effect of ice is very small, and therefore you would need to use a gigantic amount of ice to cool it by any significant amount. We’re talking about thousands of pounds of ice to cool the water by more than five degrees, and you’d need to be dumping that in on a regular basis. With that in mind, let’s all agree that unless you somehow have access to thousands of pounds of free ice each week, this isn’t the most cost-effective method! Perhaps more realistic is draining a re-filling your pool. While this is expensive because you’re paying for the water, you’ll also need to consider that you’re draining all of the pool chemicals and therefore will need to re-balance the water again. Not only that but if your municipality takes water from a lake rather than a well, it could have practically no impact on the temperature. A more serious tactic that could help temporarily would be to reduce the amount of direct sunlight that the surface of the water gets. You can do this by covering the pool with a plastic cover which doesn’t transfer much heat or growing trees around the side of the pool to prevent direct sunlight in the morning and evening. Again, this method might be somewhat effective in the someway that a waterfall or fountain could be but it’s not cheap, and we’re talking about one or two degrees realistically. If you want a serious improvement, you really need a swimming pool chiller. A pool cooling system works in the same way as a heater, it draws the water out of the pool and cools it before pumping it back in. It does this by using a large fan which blows cold air over the surface of the water when it’s inside the cooler. This allows the water to transfer the heat to the air, cooling it down by ten degrees or more and therefore having a significant impact on the temperature of your pool. There are more pool coolers on the market than you could shake a pool pole at, but there are only a couple that work well. Perhaps the very best brand is a Glacier pool cooler which is known to be able to reduce your water temperature by up to 15 degrees in 12-14 hours. They’re also incredibly energy efficient and provide residential and commercial untis. However, installing a pool cooler is a technical task. Not only are they quite sizable and therefore require an experienced installer, but whenever you’re mixing water and electricity, you must be incredibly careful. At Willsha Pools we have years of experience building pools, maintaining and improving pools including the installation of a variety of different coolers. Plus, we pride ourselves on our reasonable pricing and quality maintenance so that you can be comfortable in the knowledge that you’re getting an experienced team at a competitive price. Get in contact with us at 817.406.2269 and find out how little you’d need to pay to keep your pool refreshing all summer long.